The 24PX (also known as a 532) is an battery that is used in some older Polaroid cameras. The unusual connectors make it quite distinct with one large snap connector at each end (male one one end, female on the other). This battery replaces the following cells: V24PX, A24PX, RPX24, 2LR50, EPX24, 1308AP. 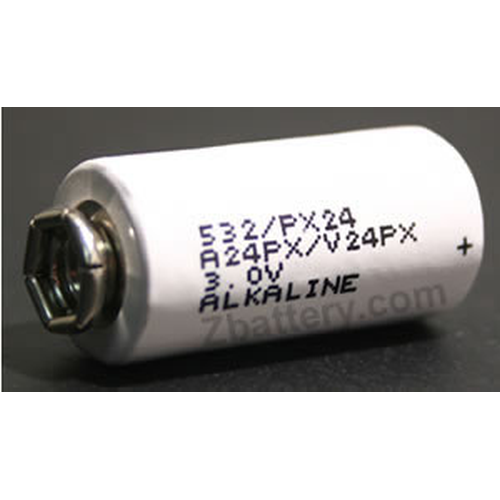 Using qty 2 batteries - 335, 350, 360, 450, M80, and Countdown 90 One of the 2 PX24 or 532 batteries is used for the built-in electronic development timer. If you do not use the development timer feature you will only need one V24PX or 532 battery.